A full day tour dedicated to visit the northern Lebanese Mountain. Start the day by visiting Gibran’s Museum in Besharreh. Continue to visit the Forest of the Cedars of Lord. Going down the road, stop at Qadisha Grotto, a beautiful natural cave situated at the best spot to have a sensational view of the Holy Valley. Continue to Tripoli and visit the castle, the old Bathes, Souks and mosques. 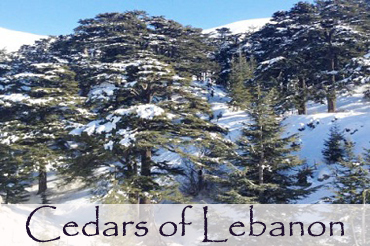 The most venerable representatives of the Cedars of Lebanon, which once covered the country's mountains, are in the Besharre region in the North of Lebanon. Hundreds of trees stand on slopes 2,000 meters high in the shadow of the 3,088 meter peak of Qornet es- Sawda.From Lebanon's cedar forests, Solomon got the timber to build his temple and palace, while the Egyptians Pharaohs used the wood carve their sarcophagi and 'sunships'. In the north, the picturesque gateway to the Cedars of Lebanon, is the birthplace of the famous Lebanese poet Gibran Khalil Gibran. Here one may visit the Gibran Museum and the many ancient churches and monastries.